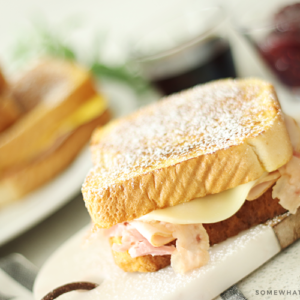 This Monte Cristo Sandwich is a quick and easy meal that will leave your tastebuds wanting more! Soft bread filled with delicious meats and cheeses, dipped in an egg/milk mixture, then cooked to a golden brown. This "French Toast" sandwich is one of my family's very favorite dinners! Heat griddle or frying pan over medium heat. Spray with nonstick cooking spray. Beat eggs with milk, nutmeg and pepper. Turn 2 slices bread in batter, then add to griddle or pan. Flip bread after it browns, 2 to 3 minutes. Top bread slices with mustard. Add cheese, bacon, ham, then turkey. Cover with another piece of browned bread to make sandwich. Keep flipping and browning like you would french toast until meat is heated and cheese is melted. Sprinkle with powdered sugar and and drizzle syrup over the top or serve with a side of syrup for dipping. These directions are for 1 sandwich at a time. If you have a big griddle, you can cook all 8 pieces of bread to make 4 sandwiches at once.